What to do when a successful career has to end? When the will to succeed is no longer there and a once spry body has been ruined by old age. To eat and eat and eat some more, and swagger around in underpants? Andy Turner has competed in the Olympics, won gold at the Commonwealths and been crowned a European champion. He was once Britain's premier hurdler, and is still the third fastest 110m hurdler in British history. He is now a champion bodybuilder. 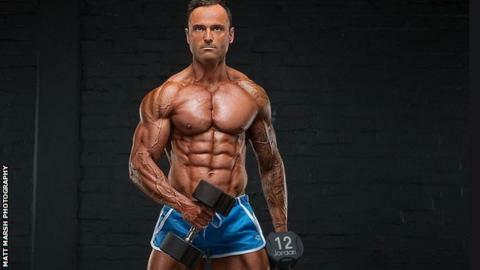 A physique which was lean and nimble has morphed into a Marvel action hero, yet to achieve such an astonishing transformation the 35-year-old has had to do more than simply step into a phone box and fling on a red cape. He has put a strain on the body and the mind, and on relationships too. Life as an elite athlete was one of routine, of discipline, of striving to be the best. There were financial rewards, recognition. And then it ended, as all sporting careers eventually must. The father of three talks of yearning to fill a "big void" after retiring. He became a personal trainer but wanted to accomplish more. Routine gym sessions quickly became monotonous, eating foods which were once a no-no lost their appeal when the body began to soften and expand. Always in the background was the fitness model brother, Garry, bigger in stature than the skinny hurdler, a man in "ridiculously good shape". Turner would hear of his Australia-based sibling competing and succeeding, and the light bulb switched on. "I need something to focus on and seeing my brother do it gave me inspiration," the 2011 world bronze medallist explains. "I saw pictures of blokes looking shredded and didn't think I could do it. I've always been lean and slim because of running but I've never been able to hold on to muscle and be lean at the same time." He approached a supplement company for sponsorship and the mission began - to prepare himself for the Miami Pro, his first competition as a bodybuilder. We're entering the domain of a food lover's fantasy: a strict diet where thousands of calories must be consumed. Month by month, Turner gradually increased the volume of food he ate, starting with 3,000 calories in January, reaching 6,000 by July. Bodybuilders call it bulking, a calculated regime to become as big as possible without adding too much body fat. Is it fun? No. Is it expensive? Yes. "It got to the point where I was force-feeding myself," Turner says, his voice reflecting the agony of the memory. "I was never hungry, always felt bloated and fat. It was horrible. "I'd buy a whole chicken every day and go through it easily. I'd go to the butcher, give him £100 and that meat would set me up for the week." To make sure he ate enough, Turner needed to cram something down - chicken, rice or oats - every two to three hours. He says he felt like a pig. Here was a man who, as an athlete, had kept his carbohydrate intake to a minimum, devouring food like never before. "I'd quite often blend the oats and add a scoop of protein powder and drink it as it didn't fill me up so much," he says. "I'd have two or three of those per day to hit my calorie target." At the gym he would focus on sculpting his body, turning bulk into muscle by lifting weights. Initially he trained once a day before increasing the sessions. There was one positive: no cardiovascular exercises, much to the pleasure of the reigning 200m hurdles world record holder who says he is "finished" with running. "It's not a full body workout," Turner explains. "You go in and say 'today I'm going to smash my chest' and you do seven or eight different exercises and walk out with your chest on fire. The next day you'll focus on your arms etc." From eating like a pig to being as hungry as a horse. Twelve weeks out from competition, Turner had to reduce his body fat by decreasing his calorie intake, reaching a stage where only "tiny" portions could be consumed every three hours, a few florets of broccoli and half a chicken breast. Bodybuilders call this stage 'cutting'. He was still training twice a day and with seven weeks remaining cardiovascular exercises were reintroduced, although nothing too strenuous. "The cardio is only walking for 40 minutes," Turner explains. "I'd get up first thing in the morning and before breakfast I'd go for a 40-minute power walk. The only high-intensity stuff would be on a Sunday morning where I'd run up my road, doing 10 runs over 70-80 metres and that'd be it." But it was on the mind that Turner found it toughest. His patience became quick to catch fire. "My missus didn't like me then," he laughs. "I'm not feeding my body what it needs to be happy. You're always hungry, always tired, and the last few weeks is brutal. You get to the point where you're starving. You get pretty moody. "I was contemplating giving up personal training, contemplating making life-changing decisions because I wasn't thinking straight, because I was so depleted of everything. It caused problems between my wife and I because I wasn't myself. "I'd have six and a half really good days eating-wise and on a Saturday afternoon I could have a pizza. For the whole week you're looking forward to Saturday afternoon when you can have a cheat meal - a pizza or a Chinese, a tub of ice cream, then on Sunday morning you're back on it again, eating healthily and dreaming of next Saturday." Turner the athlete was 77kg of speed and agility, but months of heavy lifting and dieting had turned him into a different animal. Stronger and 20kg heavier, it was as if an action movie hero was looking back at him in the mirror. "I'd never seen my body like that before," he says, still in awe of the transformation. "That's what kept spurring me on; it was new and exciting. You're like, 'hang on, things are really changing'. As soon as you get that, you get hooked." The next assignment for a man who had competed before an audience of millions in lycra was to learn the art of muscle flexing in tight-fitting shorts. "I had to go to posing lessons," Turner says, quickly adding that hiring the best coach had cost a few hundred pounds. But while his children would proudly show friends pictures of their hulking father, the financial cost of the new hobby would sometimes cause marital strife. "She knows how well financially you can do in athletics," Turner explains. "I've won medals, I'd won some money, but this is all personal gain, not financial, and she can't get her head around it and that's where we fall out a little bit." Even if the Incredible Hulk had aspirations to become a body builder, he too would have to participate in what Turner describes as the "most bizarre thing in the world", covering himself in a shade of orange usually favoured by those in reality television show The Only Way is Essex. "You stand in a little booth," he says, explaining the etiquette of spray tanning 24 hours before competition. "There are 10 booths and 10 guys all standing completely naked but for a sock and these girls are spraying you literally everywhere. The next day you come back to get one more coat and then you're ready to go." Last-minute preparations also include hydrating the body by increasing water intake by a litre a day until eight litres is being swigged daily. Sodium levels are messed up, lavatories are constantly flushing. It is, Turner admits, another horrible experience. "You can't go 20 minutes without a wee," he says. "Twenty-four hours before competition you just stop drinking completely and your body just keeps weeing, draining itself of all the liquid because you've unsettled your sodium levels. "Your muscle glyco levels just blow up. The day of competition I ate a lot of sugary sweets because they require liquid to digest, sucking out the last remaining liquid in you. "It's so unhealthy, but if you're dehydrated your skin looks thinner so it shows off everything - that's how you get the ripped look." On his bodybuilding debut, in front of a sell-out crowd in St Albans, Turner was crowned the Miami Pro champion in the over-35s category. He admits he played mind games, posting pictures on social media, wearing his GB kit during the themed round, borrowing Usain Bolt's famous pose. "Even the judges knew who I was before I went there," he says. On April 17, Turner will again step on stage to pose and flex. The competitiveness which had disappeared on retirement has slowly returned as he prepares to line up against the professionals. His rivals will be, he says, "the best of the best". "I really want to do well in this competition, to see if I can take myself further. It's more for me than anybody else," says Turner. "I'm a dog with a bone. I get bored of things eventually but for the time being I'll give it everything."